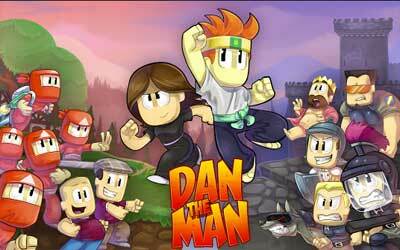 Dan The Man APK has been updated to 1.0.1. Halfbrick Studios, one of top mobile game developers with its popular game Fruit Ninja, showing off their latest game at Game Developers Conference 2016 event. Game called Dan the Man is different from the variety of their previous titles which were mostly brought arcade genre. This game is artificial studioJOHO web cartoon series with the same title. They have teamed up with Halfbrick Studios since its first episode released in 2010 ago, and finally this cooperation brings this game for us. You will play as Dan is trying to save his girlfriend kidnapped by an evil organization. His attempt to pick up the lovely heart is not easy, because the journey he traveled will be confronted with a variety of enemies and obstacles. Gameplay on Dan the Man looked like two of my favorite platformer game in the past, namely Contra and Metal Slug. The difference, the main weapon and not a rifle, but the limbs. He can punch, kick, to throw the enemy. Just like Metal Slug, you will also be dealing with a variety of boss character in the form of a giant robot combat and large-sized vehicles. The battle is more exciting because you will deal with your bare hands, making it difficult to keep his distance. A village lies in peril. An evil organization has emerged from the shadows. Your girlfriend, Josie, is fighting for survival. Punch, kick, and blast your way through 12 action-packed levels in this nail-biting platformer based on the hilarious web series by Studio JOHO. Loving this game so far only cleared first stage but I can tell I’m going to be addicted to this. Brings gaming back to basics which is what I have been looking for.